The size of downloadable Netflix videos depends on the duration of the video. An hour-long standard definition (SD) video file roughly takes about 1 GB of space whereas the same video file takes up to 3 GB when it’s in HD. An ultra HD video file (of one-hour duration) can take up to 7 GB. A couple of Ultra HD movies can easily fill up your drive! With default settings, Netflix is installed on the drive where Windows 10 is installed. The problem with this setup is that Netflix saves all downloaded videos (know Netflix download location) on the same drive where it’s installed. 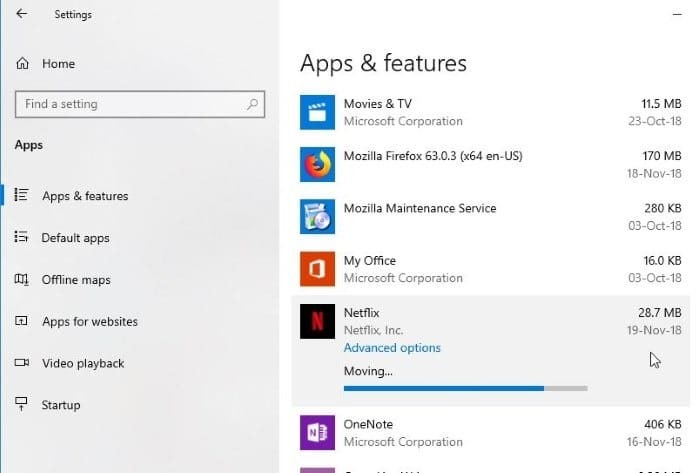 If your PC’s system drive is running out of free space or if you don’t want to fill up the drive where Windows 10 is installed with Netflix downloads, you should consider changing the default download location of Netflix. As you might have discovered by now, Netflix app for Windows 10 doesn’t offer a way to change the default download location. While we can create a symbolic link to the Netflix’s downloads folder, the workaround doesn’t work always. 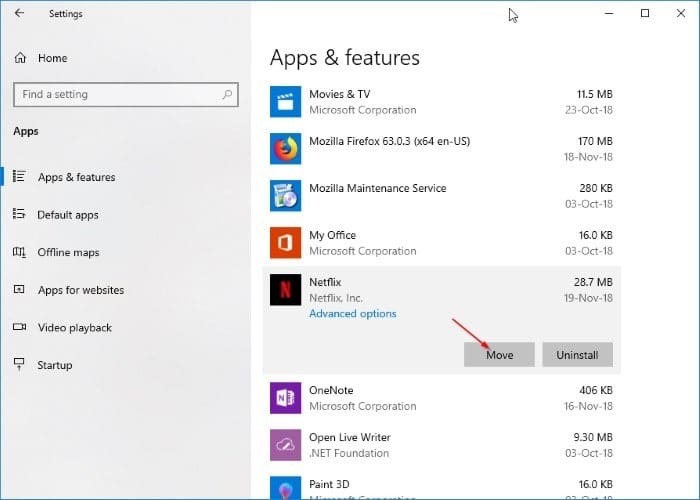 Luckily, there is an easy workaround to change the default download location of Netflix in Windows 10. The best part is that you don’t need to create any symbolic link. 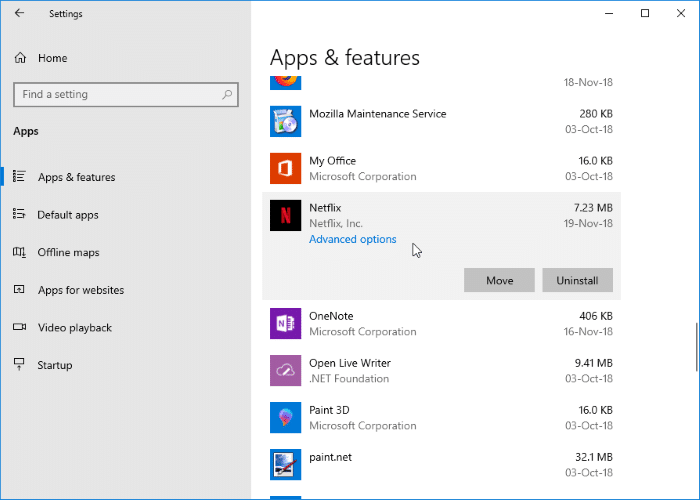 We use the provision to move installed apps in Windows 10 to change the download location of Netflix. When you move the Netflix app to a different drive using this provision, Netflix saves all downloaded videos to the new location (drive). When you move the Netflix app, it will also move already downloaded videos to the new location. So, you can safely move Netflix app even if you have already downloaded some videos from Netflix. 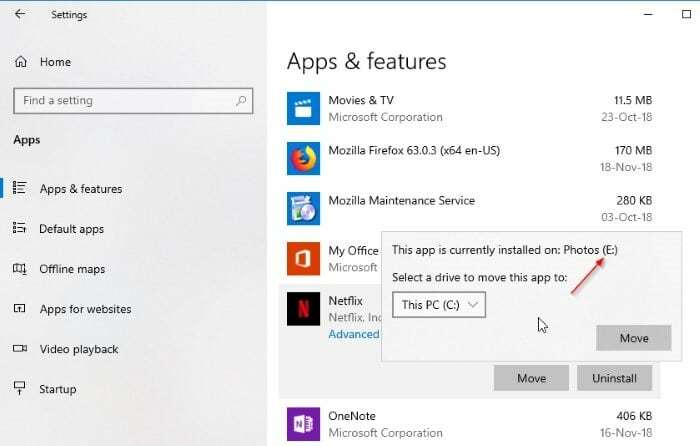 Here is how to change the Netflix download location in Windows 10. Step 1: Open the Settings app. Navigate to Apps > Apps & features. Step 2: Scroll down the app list to see Netflix entry. Click on the Netflix entry to see Move and Uninstall buttons. Step 3: Click on the Move button and then select the drive where you would like to save the Netflix app and Netflix downloads. Please make sure that the drive you just selected has plenty of free space. Finally, click on the Move button again to move the Netflix app. Note that the app is moved to the root of the selected drive. 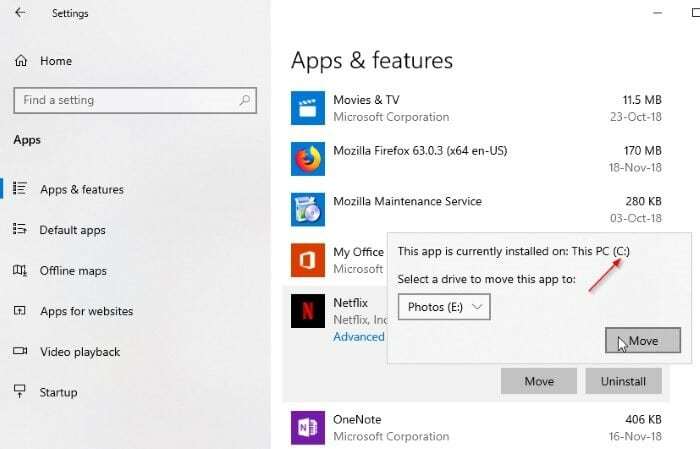 Windows 10 will automatically create a new folder called WindowsApps at the root of the drive and move the Netflix app there. You cannot select a folder under the selected drive as the new location. Please note that this will also move already downloaded videos to the new location. If you have tens of GBs of downloads, it might take a while to complete the move. Our 3 ways to relocate installed programs and games in Windows 10 guide might also interest you. Alex, maybe it’s allowed in specific region/country then? I still wonder why it’s not available for everyone. Well, i managed to change the offline map download location to D: drive. Then it created a windowsapp file on its root. When i downloaded Facebook, it downloaded automaticaly on D:, but wouldnt with messenger saying it was a systemapp or something. It’s really strange that some of you are not getting the Move option for Netflix app. I just checked again on another PC and it works there as well. My pc is a brand new Rog that goes very well. Is perfectly up to date, apps and system. So how do you manage to do it without a third party app and we can’t??? Jon and others, please make sure that you are running the newest version of Netflix app and Windows 10 (version 1809). WindowsApps needs special permission for access? I tried changing permissions in security tab but no can do? Thank’s in advance if you can help. Make sure that you are running the latest version of both Windows 10 and Netflix and then try again. The move button is greyed out, I cannot move Netflix off my C drive. So what now?